So far the only ones of its kind, Over the Moon Stories are animated books for Muslim children! There are two books available so far: Allah Made the World, and Ramadan Kareem. When you open them up, you have two options, you can have it narrated for you, or read on your own. When you click on certain things in the book, they will move or speak. The books are beautifully illustrated and written in simple rhyme. They are short stories (about 5 pages long), so good for preschoolers. 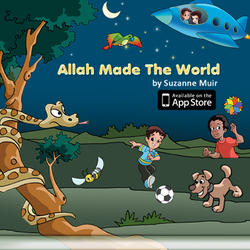 The author, Suzanne Muir, is a Muslim teacher and mom of 3 herself!